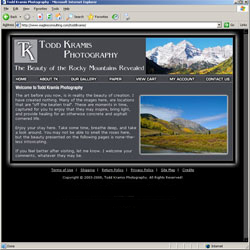 Project scope: Todd Kramis specializes in unique nature photography of the rocky mountains of Colorado. Design components: This was a re-design of an existing site that was home made. The original design did not nearly reflect the creativity and skill that Mr. Kramis brings to his photography and the new design accurately reflects his vision of his work. We produced a new logo as a ligature and all the site graphics and design components. 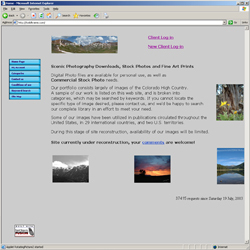 Mr. Kramis provided a wide selection of his favorite photographs to incorporate into the site. Shopping Cart: The site uses our in-house shopping cart.